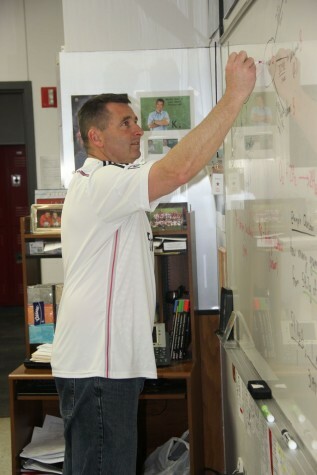 The late nights, the tape rewinding back showing the ball being kicked into the net by the opponent, the early mornings with clipboard and markers and pages of notes was former Coppell girls soccer coach Chris Stricker’s life for 20 years. But it all changed when, after winning the state championship, he announced that he going to retire and focus on teaching chemistry. Although coaching soccer was one of Sticker’s passions, it was hard for him and his family as he worked long days, beginning with early mornings and ending with late nights. And with his mind always on coaching, it was hard for him to focus on other things. And with him having stepped aside from coaching, he has more time for his wife and kids, Jake, Syler, Zach, and Allie, as he can attend his son’s basketball games, and is able to relax more without being exhausted from a long day. 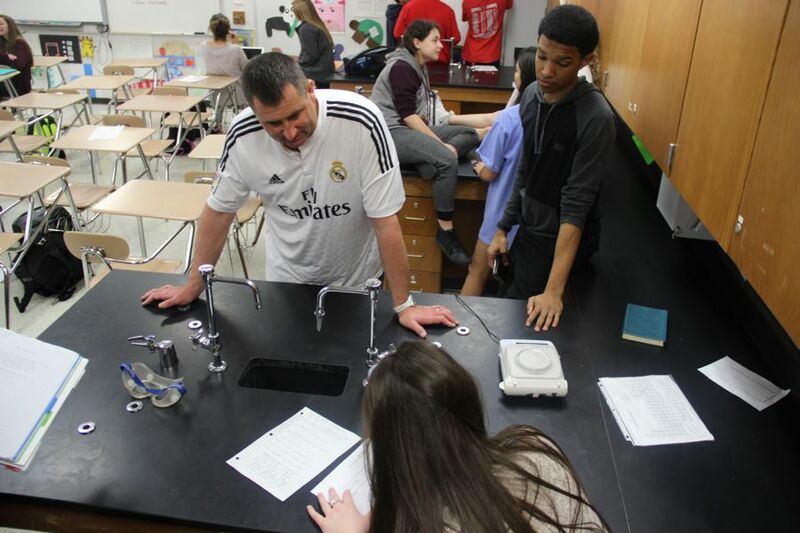 Coppell High School chemistry teacher Chris Stricker helps students better their education during class on Friday. Stricker was a former soccer coach and retired that position last year after winning the Cowgirls won state. Even though he has more time available, Stricker has left behind a part of his life as he transitions his focus from being a coach and chemistry teacher to only chemistry. Coaching was a big part of life, and having these connections with the girls mattered because it let them become a better team. And although he left the program on a high note and chose to spend more time with his family, he still misses the aspects of coaching. “I miss the girls tremendously and I miss the other coaches a lot, just the camaraderie; it’s like being in a fraternity at the high school and stepping away from that and I do not see the guys as much, but I still see the girls in the hallway and try to encourage them as much as I can,” Stricker said. Stricker spent 20 years of his life with the Cowgirls in order to help them improve on the field. Though most of the players, such as senior Shay Johnson who played varsity soccer under Stricker for three years, they think it was as good of a time as any for their coach to retire. But with him gone, the players will not forget Stricker’s coaching and his impact on their lives. Even though Stricker was able to leave victorious after winning his last game with the Cowgirls, it was not easy for him to leave especially with the time he had invested in this program and the Cowgirls. But even though Stricker will no longer be coaching at the school, he is still a coach for Club Soccer, more specifically the Solar Boys, and has not yet completely retired from his passion.